What to do with wood chips from a wood chipper? Why do we need to search and research information about the best Snow Blower out there? Why can’t this information be all in one place? Well, now it is. No one likes to waste their hard-earned money on something that doesn’t work right. No matter the name, country of manufacturing or even the price that doesn’t determine if it is a good product or not. What determines if It is a good one, depends on what is under the hood. Is the motor good? What are the augers made from? Does it have a headlight? Is it gas or electric? The more you ask the better the decision you’ll make. Under $200: WEN 5662 Snow Blaster. Under $400: Snow Joe iON18SB-HYB-RM. Under $600: Power Smart DB7103-26 . Under $700: Power Smart DB7659H. Under $800: Poulan PRO PR241. Under $900: Briggs and Stratton 1696619. 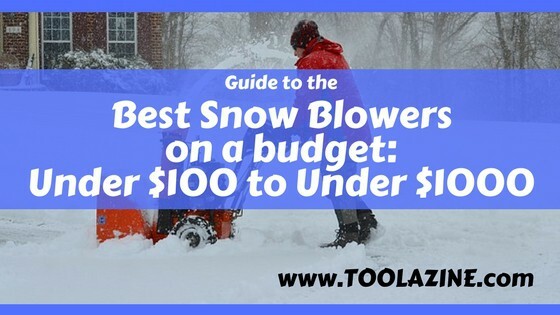 Below I will list the all the snow blowers reviewed in price categories ranging from under $100 to just over $1000. Let’s go! This is THE ULTIMATE GUIDE on snow blowers. It is a long in-depth article. If you are looking for something specific please use the table of contents above. Most items are available on Amazon, you may want to add them to your cart on Amazon and decide your final choice another day. I also suggest that, since this is such a long epic article, that you bookmark this article in your web browser so that you can finish reading it another day. My pick for the Best Overall Snow Blower is the Briggs and Stratton 1696619. It is a two-stage snow thrower with a powerful gas powered 250cc motor. Brings 11.5 foot-pounds of torque. Assembled with a reliable electric start for easy starting. Being a medium duty snow thrower is can clear a good 27-inch-wide and 20-inch height with extreme effectiveness. The freehand control lets you control the snow blower with one hand, so you operate with the other. The mounted dash chute rotation and the chute deflector make it easy to move the snow from the yard with the 14-inch by 4-inch tires. I believe the YardMax YB5765 is the best for better handling. Prepared with a 6.5 hp, 196cc, and a self-propelled driven motor with multiple speeds. Five speeds forward and one speed in reverse. The blade-shaped housing cuts through the ice and snow easy. Easy to start engine and steel auger, let the snow to be thrown up to 30 feet away. The heated hand grips, cup holder and a LED headlight for some nighttime snow blowing. The Greenworks 20-Inch is the best bang for your buck. It is electric, perfect for lighter loads and great with smaller driveways and sidewalks. It is equipped with 13-amps and 120 volts. Also has minimal vibration and very quiet. It is lightweight. Weighing in at only 30lbs and clears out 20 inches in width and 6 inches in depth. Requires no gas since it is electric. No maintenance or pull cords needed. Compact for easy storage. My top pick for the Best Snow Blower under $100 is the EJWOX. It weighs 22.4lbs. There isn’t much difference in the price comparison here, but I do think the price is decent for the features you get with this snow blower. It has 5-inch wheels, an adjustable handler which is good for people of all heights and can blow up to 700lbs of snow per minute. Is money the most important thing to consider when purchasing a snow blower? How about quality? The Earthwise SN70016 has my vote for both! It is a boundless low-cost snow blower that can throw snow as far as thirty feet. Along with a twelve-amp motor, this snow throwing machine is equipped with a 16-inch clearing width and an 8-inch clearing depth. Who doesn’t want that? The assembly is quite easy and takes little no time to put together. The snow thrower also comes with six-inch transport wheels which makes pushing it around a little easier. It also comes equipped with an adjustable support handle and an easy controlled discharge chute rotation control. I like this certain snow blower because it is easy to handle, even though it is corded, it is powerful and does throw snow as far as I need to it. Not to mention it is easy on the wallet. Click here to check the snow blower’s price. As with all machines, it does have a couple disadvantages. When shopping around for the better snow blower with a powerful motor, this is my choice. The Power Smart DB5023 is able to get through with 18 inches wide and 8 inches deep within one pass. I like that it has a 13-amp motor, 120 V, and 60 Hz and it throws snow up to 30 feet at a great price. Even though it does weight 37lbs and it is corded, I still like it for the fact of the easy mobility. It is electric, so it does start instantly. With no wheels, you do have to push it. Which can be hard on the elderly or disabled. Everything has its drawbacks and with this one, since it does not have wheels I wouldn’t recommend it to everyone. Click here to check the snow blower’s price. Weighing in at 22.4 pounds, made of steel, at 120 volts and 9 amps, the EJWOX it a great snow blower for the price. Being that the EJWOX has a bit lower amp but that doesn’t make it any less durable. I appreciate the snow blowers that have an adjustable handle, it sure helps when you are on the shorter side. The EJWOX has the power to remove up to a whopping 700 pounds of snow per minute and throw it up to 20 ft. with the 90-degree throwing angle. The large 5-inch wheels are great in helping move the snow thrower. It is electric so that means you will have to buy an extension cord just make sure to get the right one based on the volts of the snow blower. Click here to check the snow blower’s price. The better snowblower to buy under $200, in my opinion, is the WEN 5662 Snow Blaster. It has a 180-degree control. Throws snow up to 20 feet away unlike the All Power America which only does 9 to 19 feet. Equipped with 6-inch wheels and a 13.5-amp motor. Perfect for storage which is a plus if you have a smaller house. The WEN 5662 Snow Blaster is a well-built machine. The 180 degrees of control lets you effortlessly change the direction you want the snow to be thrown. The two six-inch wheels make it easy to move where you need and has a collapsible frame that makes it easy for storing. The WEN Snow Blaster can clear up to 1150 cubic inches of snow for each auger rotation. The ability to throw snow up to 20 feet away is a virtuous feature. When you add the 13.5-amp motor, 6-inch wheels, and a 2000 RPM Auger, I believe this is a great investment. Although not all machines are great or have all the features. This one is made mostly of plastic and not as much power as a gas thrower. You will also need to purchase an extension cord as you do with most electric snow blowers. Click here to check the snow blower’s price. Being CSA Certified (Canadian Standards Association), you never have to worry about tune-ups or maintenance. This snow blower can throw up to 800lbs of snow per minute with its 13-amp motor. Being an electric snow blower, it does need an extension cord to use. It can quickly clear 10 inches thick and 18 inches wide paths. The handle is made of foam which is great for easy pushing. It is easy to store, just unplug and fold the handle down. The only assembly required is the handle and lever which is quick and simple. The chute is level is also adjustable. It weighs 36 lbs. I would say that it is not the lightest snow blower but not the heaviest either. The blades are plastic, this is where I could see a potential issue with going throw rough patches where there might be ice or very heavy/wet snow. Click here to check the snow blower’s price. This little machine sure knows how to get the job done. Very user-friendly and a plowing capacity of 7,750-square feet per hour and can throw snow anywhere between 9 to 19 feet. It is electric, so you do need to buy an extension cord it is recommended to get one at high power at least a 13-amp. The snow blower does have wheels which makes it easy to push. Light enough so you can lift it up and carry it for easy storage into the house. I give it a personal rating of 3 since there is no assembly, the auger is made of metal, but it does only throw between 9-19 feet. Click here to check the snow blower’s price. In my reviews of the best snow blowers under $300, I focus on the specs and what the main features are. My pick for the best one under $300 is the Toro 38381. It only weighs 25 lbs. and has the power to clear 18 inches in width and 12 inches in height of snow. That is more than the others and a more powerful motor. This Greenworks Snow Thrower has a sturdy 13-amp motor and works on 120 volts. It can discharge the snow up to 20 feet with the adjustable direction chute. Moreover, it weighs only 30 lbs. Known for being powerful, quiet and with less vibration, it is easy to see why I give it 5 stars. It has a 20-inch clearing width and can go 6 inches deep. Make sure when you buy it that you get the right extension cord to go with it. Having an electric and economical motor means no gas, pull cords or maintenance. Very lightweight weighing at only 30lbs. Perfect for your small driveway and sidewalks. Click here to check the snow blower’s price. Toro is known worldwide for being the number 1 brand of electric snow blowers. It can clear a good seven hundred pounds of snow per minute. Only weighing 25 lbs., it has the power to clear snow of 18 inches in width and 12 inches in height. It comes equipped with 15 amps, for powerful blowing. This Toro features the “power curve technology” this helps to prevent clogging. It also can lock in the angle that you wish to throw the snow in. The six-inch rugged wheels provide traction which makes it easy to move. It is electric so no running out of gas. Although with all the good specifications, there are some that are not so good, that some people may have a problem with. For example, it is made of plastic, the output chute may clog and looks to be a bit more expensive compared to other snow blowers with similar specifications. Check the latest price here on Amazon. The Snow Joe iON is ideal for moving snow from driveways and sidewalks. It is a quiet and cord-free powerful blower. The Snow Joe is powered with Eco Sharp technology. It also has a 40-volt lithium-ion battery that gives you up to 50 minutes of quiet running time with no carbon emissions and no cables! As with many snow blowers is has an adjustable handle for comfort and will start with ease at just a push of a button. A nice feature to the snow blower is the heavy-duty steel auger with 2 rubber blades. It will remove up to 495 pounds of snow each minute. This means a nice cleared path of 18 inches in width and 8 inches in depth. The iON allows you to be able to throw the snow up to 20 feet in the direction you wish. This also significantly weighs less than the traditional gas blower. It is perfect for blowing your deck and for nighttime snow clearing with the equipped headlight. Click here to check the snow blower’s price. My top pick for the best blower under $400 is the Snow Joe iON18SB-HYB-RM. Compared to the Jonsered, you can choose between using the lithium-ion battery or hook it up with an extension cable. With the battery, you will have 50 minutes of clearing. The Jonsered you only have the option of gas which will run out eventually. The Snow Joe can clear up to 500 pounds of snow a minute and weighs less than the Jonsered. With the Snow Joe iON18SB-HYB-RM, you can either choose to use the interchangeable rechargeable lithium-ion battery or hook it up with an extension cord. The battery gives you more than 50 minutes of quiet snow clearing. Along with no carbon emissions to help keep the air clean. Powered by a powerful 13.5-amp motor you are easily able to start with just a push of a button. It is also equipped with a heavy-duty auger and can clear out 500 pounds in a minute. The clearance for this one is 18 inches in width and 8 inches in depth. It does have an adjustable chute, that means you can choose up to 180 degrees and up to 20 feet where you want to blow the snow. Works for nighttime snow removal with the help of a headlight. At 39.5lbs, and big wheels it is easy to control. Click here to check the snow blower’s price. The Jonsered ST1153EP is not the lightest gas snow blower out there but it is not the heaviest. Weighing in at 98lbs it is easy to see why this might not make the best of the list. Even though it is easy to use and can clear up to 8 inches at a time the weight may be the turn off on this one. It is designed for flat and more narrow places and only suitable for the occasional use. It is easy for storage and easy to operate. Click here to check the snow blower’s price. The better snowblower for me under $500 is the YardMax YB5765. Yes, it does weight more and costs more, but it has a more powerful motor. It is self-propelled and equipped with a LED headlight. Needs minor assembly, other than that it gets a 5-star rating in my book. This YARDMAX YB5765’s motor has 6.5 hp, 196cc, and is self-propelled. Yardmax gives you the option of multiple speeds with the self-propelled drive, five forward and one reverse. The ax-shaped housing cuts through the ice and snow easy. Equipped with an aluminum gear case and steel gears. Using synthetic oil will extend life. The easy to start engine and steel auger, allows snow to be thrown up to 30 feet away. Even though it is 125lbs, it is self-propelled which makes it easy to control and push. A bonus that is totally worth mentioning is the heated hand grips, cup holder and a LED headlight for some nighttime snow blowing. Making for blowing heavy and light snow. You will have to assemble it but that shouldn’t too much of a problem with all the equipment it comes with. This one will be given a 5-star rating in my book! Click here to check the snow blower’s price. Troy-Bilt products have been around for as long as I have known. This Troy-Bilt Squall gas snow thrower is nothing short of a snow blower. In fact, it is a very useful and powerful machine. The motor has a 208-cc electric start and 21-inch single stage. The 21 inches in width and the 13 inches in depth you can effectively clear out snow within one pass. All with the help of the deluxe reversible skid shoes. With the chute, you can change direction up to 180 degrees. There are eight two-inch tires for traction. It does come almost completely assembled you will have to bolt the snow chute on the top and the handle folds for easy storage. Click here to check the snow blower’s price. Power Smart DB7103-26 is a powerful snow blower that comes ready with an electric starter. The motor is very powerful with 6.5 HP and 212cc. The self-propelled feature is what helped me make up my mind between these two products. That is a must for me. Therefore, it is my top pick for the best snow blower under $600. The Power Smart DB7103-26 is a two-stage snow thrower that comes equipped with an electric starter. The 6.5 HP and 212cc motor provide powerful snow clearing of 26 inches in width and 21 inches in depth, perfect for the extreme weather. The drive system also allows for 6 forward and 2 backward speeds great for heightened driving ease. As powerful as it is, it is heavy weighing in at 184.48lbs. A good thing is, it is gas so that means no need to purchase an extension cord. It will throw the snow up to 30 feet and has a 180-degree chute, so you can control where it goes. The LED headlight adds great value especially when you need to operate at night or early morning. Self-propelled steering and the interlocking handles are great when the weight factor might drive you away. From reviews and reports I can determine this machine is great for long or short driveways. It can clear snow up to 21 inches in height. The auger seems to have a few issues with just stopping and finding replacement pieces are not so easy. Click here to check the snow blower’s price. Being a Husqvarna, a well-known brand, you would think that this is a keeper, this will do great. Well in some cases it may, and it may not. It turns out the muffler, auger and the belt seem to have the most problems. Although the weight is great, the cons outweigh the pros in this snow thrower. This Husqvarna snow thrower has 8-inch tires for easy pushing in the snow. Equipped with a manual chute deflector and rotator, electric start and a 5.4hp 208cc motor. It is gas powered with an electric start so not having to drag an extension cord out behind maybe a good thing for some. With the sturdy 4-ply rubber augers, it can clear out a 21-inch path. Comes with auger housing, a non-clogging tread, and scraper skirt makes snow blowing a breeze. The quick release folding allows for easy storage with minimal problems. Click here to check the snow blower’s price. When looking for a powerful and dependable snow blower that won’t disappoint, I recommend the Power Smart DB7659H. It has a 212cc motor that is a dual stage and only weighing at 140lbs. This one can clear 22inches while the Husqvarna only clears 21inches. Also, it is self-propelled with 13inch tires that never go flat. The Power Smart DB7659H has a powerful 212cc, gas powered motor. Also, it is a two-stage snow thrower weighing in at 140 lbs. It has a compact and lightweight design even though it is 140lbs it will still pack a punch. It can clear 22 inches in height and 16 inches in depth. Some assembly is required. Such as the 212cc motor will need to be assembled. Posing a concern for some who are not on the handy side. It is armed with four speeds forward and two speeds in reverse. The chute can turn manually and throw snow up to 40 feet where ever you wish. Being self-propelled, having a recoil start, and 13 in inflatable tires there are should be no issues with controlling this 140lb snow blower. The 10 inches, serrated, steel auger helps pull the snow to the blower in rough conditions. Also comes ready with a foam grip for comfort during steering. Click here to check the snow blower’s price. Husqvarna is known worldwide and has many products on the market. That doesn’t mean that since they are well known, and a huge company that their products are the best. Take the Husqvarna 961830004, for example, some good and some bad. Has a powerful motor at 208cc, 5.4hp with an electric start for easy startups in the cold weather. It comes ready with an adjustable chute, so you can choose what direction you want the snow to blow in. The rubbers auger works unbelievably on many different types of surfaces like gravel and pavement. It is so powerful it can just about be self-driven. Comes with LED headlights which may be needed when snow blowing in the dark or even early morning. The adjustable angled handle comes with an over-mold bail arm for optimal comfort. The scraper skirt which is reported to have small issues, should clean the ground and keep the snow away from your feet, who like wearing wet and cold shoes? The fuel tank has issues with staying connected. Same thing with the muffler detaching from the exhaust. Well, at least it is easy to assemble. Click here to check the snow blower’s price. Are you in need of a powerful snow blower that won’t let you down? If so, I suggest the Poulan PRO PR241. This company has been around for many years, since 1944 to be exact. They make many different outdoor equipment and accessories. The main reason I recommend this machine is because of the ability to take on longer, larger, paved and graveled areas and even multi-car driveways. The ribbon auger, deep tread tires for great traction and the adjustable handle heights are nice features. The Poulan Pro PR241 comes from a company that I have never heard of before. They have been around since 1944 manufacturing much different outdoor equipment. This snow blower is ideal for large paved areas, gravel areas, multi-car driveways and sidewalks of many sizes. This model comes with a new friction disc transmission, that means less room for damage. It has an improved ribbon designed auger to help with the mixing of snow and air this makes the snow much easier to handle and lessens the time to clear out the snow. The housing for the auger has been updated and is now bolted instead of welded. They did this, so it will hold up to its durability. The control panel has also been redesigned and easier to use. The handle height has four different positions to help people of all heights. The company has enhanced the power steering to make it easier to move the snow blower around at 240lbs you’ll appreciate this. This snow thrower does weight 240lbs meaning it is on the heavier side. It has a twenty-four-inch clearing path and can clear 24 inches in height. Comes ready for action with a 180-degree remote chute rotation with a remote deflector for ease in throwing the snow. The speeds are 6 forward and 1 reverse. A few other specs are that is has deep tread tires, awesome for traction, friction disk drive and an oversized fuel cap, with click style. I honestly can not find anything bad about this model other than the weight, which could cause issues with some people. Click here to check the snow blower’s price. A great blower is the Snow Joe ION8024-CT. Comes with multiple headlights, perfect for night snow blowing, two stages, 80 volts, four speeds, and will clear out an easy 24 inches. The Snow Joe is also self-propelled and weighing in at 105.8 lbs., lighter than others in this category. This is great for people who don’t like pushing much. This is a cordless snow blower with a rechargeable, 80-volt power plant and a 2500 W motor. Comes with two compatible Eco Sharp 40-volt batteries. You get up to 30 minutes of gas free and cord-free snow blowing. All that with no carbon emissions. Which is great for keeping the air clean. The ION8024-CT starts with just a small push on the display panel. With lit icons on the digital panel, you will know in an instant your battery life. Has trigger grips for comfort which helps to reduce the stress from squeezing. The four-speed drive system is digital. With a sturdy 2 stage serrated steel auger and the powerful impeller, it can move up to 1000 pounds a minute. Able to clear out 24 inches wide and 13 inches in depth within a single pass. There is also a combined scraper bar at the bottom of the unit. This lets you clear the snow right down to the ground, and you won’t have to worry about any damage to the pavement or to your deck. Click here to check the snow blower’s price. I would recommend Briggs and Stratton 1696619 to anyone. I believe that anything that has a Briggs and Stratton motor is the most dependable out there. In all my years of purchasing outdoor equipment, I have never had a problem with one. Compared to the Champion, the Briggs and Stratton 1696619 has a clearing path of 27-inches wide and a 20-inches depth. The Champion only has 21 inches in height and 12 inches in depth. The outside is made of steel, so it is made to last. Champion Power Equipment has been around since 2003. They are known for their trustworthy and durable outdoor equipment. The compact, 224cc Champion snow blower is nothing short of that. With the 224cc gas engine, it is one of the more powerful motors in its class. Starts at just a push of a button. Equipped with 6 forward speed and 2 reverse speeds. Clears a good 24 inches in capacity, 21 inches in height and 12 inches in depth. The carbon-steel auger is 12 inches and can easily cut through old packed snow and even ice. The powerful impeller provides a clearing of up to 43 feet. The compact design is great for those who don’t have much room for storage. The convenience of easy handling and storage goes a long way with me, I don’t have much room for storage myself and this is a plus on my end. Click here to check the snow blower’s price. Briggs and Stratton are known for its indestructible engines. Well, it is with me. Every Briggs and Stratton I have ever owned the motor has never had any problems. They manufacture almost any outdoor equipment you need. Even snow blowers like the Briggs and Stratton 1696619. Being a medium duty, two-stage snow thrower it features a 27-inch-wide clearing path and a 20-inch opening height for clearing with great skill. The push button starter is great for starting in the coldest weather and the sturdiness to work easily during the heaviest snowfalls. Featuring the hand free controlling, the simplicity of this machine allows for you to drive the snow blower with one hand and operate with the other. The steep skid shoes are reversible to help in guiding the snow in tough conditions. Has seven speeds, 5 forward and 2 in reverse with a 12-inch steel scroll auger. Equipped with a friction disc transmission, dash mounted chute that can rotate, and an on-panel deflector control makes snow blowing with the 1696619 Briggs Stratton a breeze. With the steel frame, this snow thrower is made to last. Check the snow blower’s price here. If I had to pick the best snow blower under $1000 I would have to pick the Husqvarna ST224P. Husqvarna has been around for a while now and is greatly recommended by professionals. This model comes with a 2.7-liter fuel tank and 15-inch tires. The Husqvarna 961930097 is self-propelled which is my preference, but it doesn’t come with other features that I enjoy as well like the ST224P. For example, the power steering and skid shoes that help with easier operating on more valuable and sensitive surfaces. Husqvarna sells everything from outdoor equipment to protective clothing for operating that outdoor equipment. They are known worldwide for their products. The Husqvarna ST244P is a dual stage, electric starter, and power steering snow blower. Equipped with a 208cc motor the snow thrower can handle between 2 and 12 inches of snow in a 24-inch path. Fifteen-inch tires help maneuver the thrower with the help of heated grip handles for comfort. Comes ready with a 2.7-liter fuel tank, 12-inch ribbon designed auger, friction disc transmission and an aluminum gearbox for protecting the insides. Power steering helps to lessen the risk of slips with the trigger control. It boosts the maneuverability and the grip on the left and/or the right wheels. Great for reducing worker fatigue. Skid shoes are made from composite for a smoother operation and a lesser damage to the most sensitive surfaces. Click here to check the snow blower’s price. Being a Husqvarna, you already know this will be a good one. With a gas-powered 254cc motor there is no wonder it can clear a path of 27 inches and 2 to 12 inches of snow without a problem. This two-stage electric start snow thrower is easy to move around and push with the power steering and heated handle grips. The 12-inch improved ribbon designed auger, friction disc transmission, and the aluminum gearbox make for most of the impressive features. Weighing at 240lbs I can see where it would be a hassle for some, but it is self-propelled, so you’ll only have minimal pushing to do. It does come with 15-inch tires and a 2.7-liter fuel tank. As a bonus, it has a 180-degree chute and remote deflector for throwing the snow wherever you want. Click here to check the snow blower’s price. Honda has been here for a long time making everything from cars to small engines. The Honda HSS1332AAT is a powerful 389cc GX OHV motor. It is on the heavier side, but it has the speed and clearing path of 32 inches wide and 2750lbs a minute. The Ariens Snow Blower doesn’t have much information, so I won’t be too hard on it. It does have a cast iron top for leak protection and can clear 70 tons of snow per hour, so I’ll give it that much. Wow, Honda really does make everything that has an engine attached. The Honda HSS1332AAT has a gas powered 389cc GX OHV motor. This blower weighs 276lbs! It will clear up to 32 inches wide at 2750lbs a minute. Making the snow blow up to 56 feet away from any way you prefer with the electric chute control. With the rubber tracks attached to the wheels, you can clear snow on many different surfaces such as pavement, concrete or even gravel. The low temp rubber tracks are equipped with gripping cleats. The tracks bring you excellent traction control through just about any condition. With all this, you will never have to worry about flat tires or even frozen chains. The Honda has a hydrostatic transmission which lets you quickly match the speeds with the snow situation. The easy to control level precisely alter the speed and not affect the revolution speed of the auger. All you need to do is push forward to go ahead and pull back to go in reverse. The skid shoes are a great design made from durable materials. They are reversible and you get twice the life from one side. When the first side is worn down just flip them and use the other side. The auger is bearing supported and is equipped to handle ice braking, and dependable when the snow throwing gets rough. Click here to check the snow blower’s price. I haven’t heard much about the Ariens brand. This Ariens Snow Blower has a dual stage, electric start, gas with auto turn steering. The motor in the Ariens is powered by Briggs and Stratton. That means you will get a for sure start each time. It has a 1-2-3 start. Ready with a fuel shut off switch, alternator and a rather large fuel volume at .725 gallons. Made of steel and has 6 forward and 2 reverse speeds. It is self-propelled which is why I make it my number one in this category. This one has a 205-degree remote chute and deflector control. It can clear out 28 inches in width and 21 inches in height and throws up to 50 feet away. Large halogen headlight in the dash help to guide us when we are out late snow blowing. The double belt auger system provides you with more power from the engine and gives the belt a longer life with minimal maintenance adjustments if any. Click here to check the snow blower’s price.